Almost all of the photos of comet 67P that you have ever seen on this website have come from Rosetta's workhorse navigational camera. Images from the science camera, OSIRIS, have been few and far between, and are generally released long after they were originally taken. But that's about to change: ESA announced today a new website at which the OSIRIS team will now be releasing images on a regular basis -- at least one per week -- and they will be recent. The first image released on the OSIRIS "Image of the Day" website was taken on December 10, about 40 hours ago as I write. And it is so beautiful. Look at all the fine details -- the fractures, the boulders -- and all the subtle variations in surface brightness and texture. 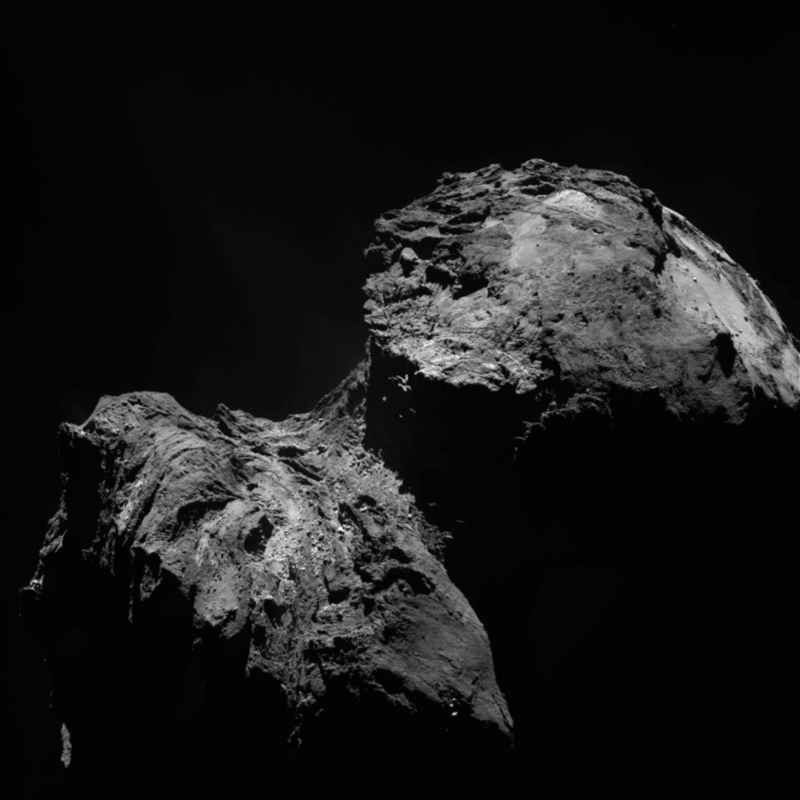 And this is just one photo; OSIRIS has been taking many like this nearly every day since it arrived at the comet. Rosetta took this photo of comet 67P/Churyumov-Gerasimenko on December 11, 2015. It is the first image released as part of OSIRIS' "image of the day" program. The ESA blog contains even better news: OSIRIS data from earlier in the mission -- through September 16, 2014 -- has been delivered to the Planetary Science Archive, the public repository for ESA mission data, and its public release is expected next week. A great Christmas present! If you play with the levels in the original image, you can see that there is a lot of data lurking in apparently black regions of the photo. It's all posterized because JPEG format wrecks all the detail in those dark areas of the image, but in the original, full-bit-depth OSIRIS data, you can bet there is a lot of subtlety to the jets, and possibly even coma-light shining on nighttime areas of the comet nucleus. All of that will be visible in the archival data, which is why I absolutely cannot wait for its release. Brightening an OSIRIS image of comet 67P taken on December 10, 2015 reveals hidden coma and jets, outlining the night side of the comet's nucleus. I'd like to see before and after perihelion images and comments.